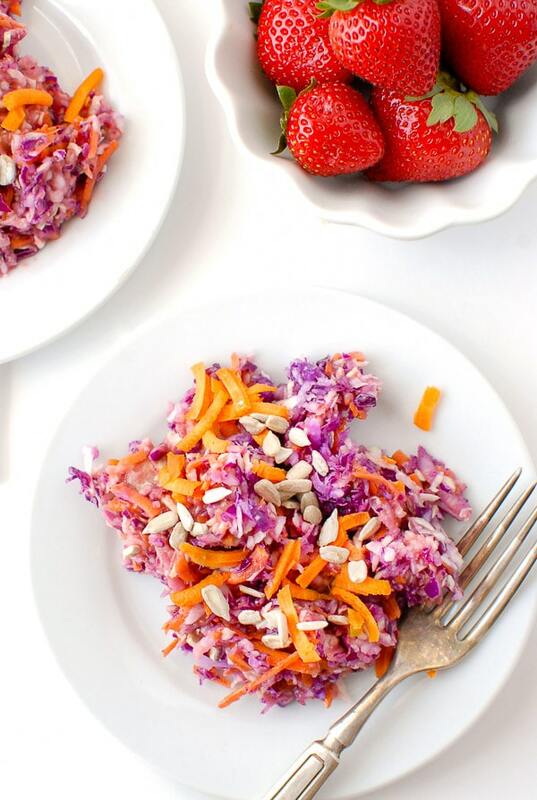 Summer color and flavor are bursting at the seams in this Crunchy Confetti Slaw with Strawberry-Peach Balsamic Dressing. 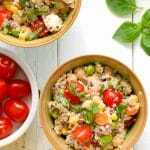 It’s a simple to make salad that is a perfect side dish recipe for dining al fresco or adding some sunny color to a meal in the colder months. I like pretty things. Maybe not what you’d consider traditional ‘pretty things’ but really I like color. And texture. And diversity. Maybe it’s the sign of a short attention span. Or because I’m a Gemini. When thinking of a recipe to celebrate summer (that could be tucked into school lunchboxes too), I wanted to incorporate all these things; color, texture and diversity. I wanted that first glance to be exciting. And happy-making. The concept of ‘eating the rainbow’ leapt to mind. Despite possibly sounding like the objective of a 1960’s acid trip, eating the rainbow is the nouveau goal of consuming foods of all colors in a day. Each color group of produce bears different nutrients and eating all of them affords positive variability in one’s diet. But there is no reason a healthy recipe needs to take a long time to make and cannot still be fun. 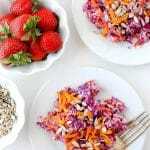 In steps Crunchy Confetti Slaw with Strawberry-Peach Balsamic Dressing. Both my children have always taken lunch to school due to our inability to eat gluten but the younger loved ‘Rainbow Day’ in elementary school. On Rainbow Day, all the students eat for free from the school cafeteria salad bar, getting a sticker if they eat foods of all the colors of the rainbow. Somehow making it a goal and involving the sticker gets kids very excited about eating produce that may normally cause noses to be turned up. 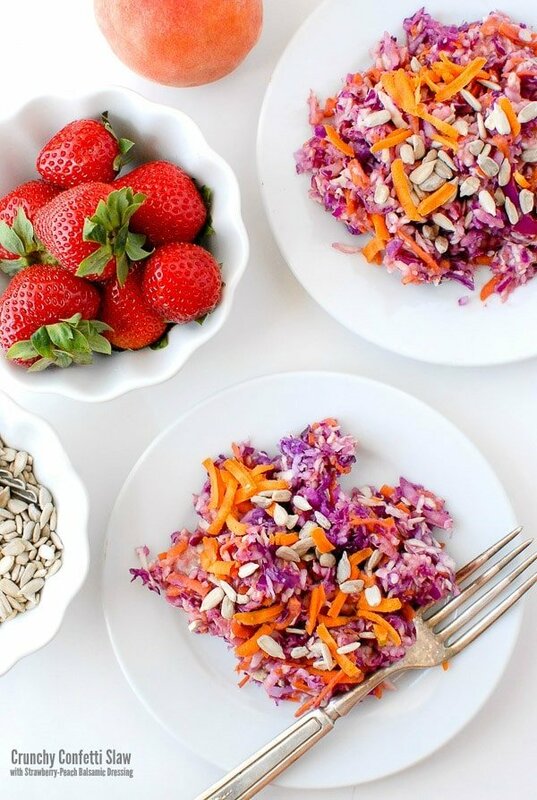 Crunchy Confetti Slaw with Strawberry-Peach Balsamic Dressing brings Rainbow Day to your dinner table. 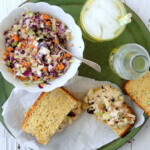 I simply love this slaw recipe. It’s made quickly and simply with the aid of a food processor, dressed in a way that will add more nutrition as well as taste-appeal while using as many of the rainbow colors possible. Adding the fruit to a simple balsamic vinegar dressing, sweetened by honey, keeps the slaw fresh and the flavors familiar though unexpected in this dish. The sunflower seeds give it a crunch I love. With honey being a natural preservative as well as the vinegar, the dressing will remain fresh in the refrigerator for three weeks able to use it on lettuce and fruit salads too. And I think it’s very pretty. Don’t you? To keep the slaw crunchy, keep the slaw and dressing separate, mixing just before serving. 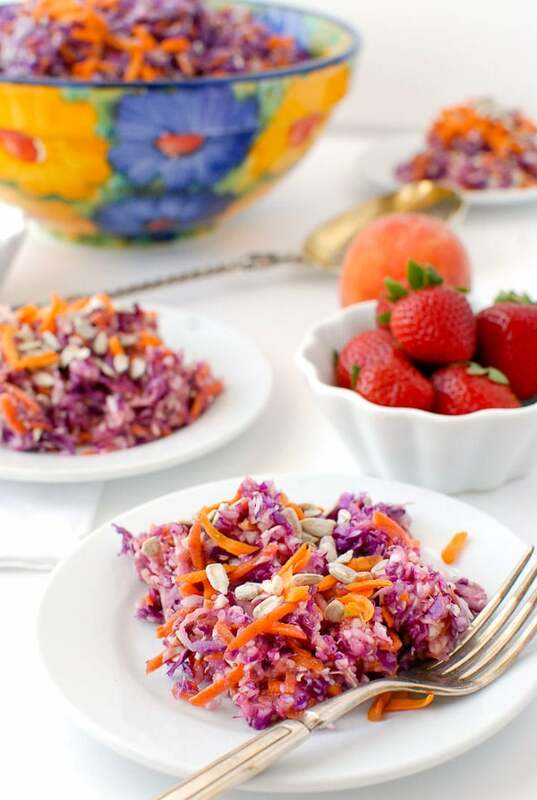 If you have extra undressed slaw it can be kept in an airtight container in the refrigerator for another use and dressed when needed.This ample dressing recipe will produce more dressing than is needed for the slaw recipe. Keep extra dressing sealed in a the refrigerator to use on other saladsI used fresh fruit to make the dressing however if you desire to make it out of season it could be made with frozen, thawed fruit since it is pureed into the dressing. Using the grating disk in a food processor, grate the green cabbage, purple cabbage and carrots. Transfer them into a large serving bowl and set aside. In a blender combine the strawberries, peaches, honey, oil and balsamic vinegar. Pulse until it liquefies into a dressing. Toss the amount of desired dressing into the slaw. Add 2 tablespoons of sunflower seeds on top of each serving. 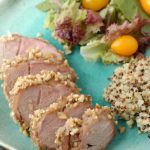 This delicious recipe was originally published in September 2012 and has been updated in 2016. 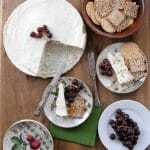 It was included in the Family Flavors eCookbook; a collection of healthy, quick-to-make recipe each with 10 ingredients or less. Wow, such a amazing article.